I would like to take to the time to remind players that the theme is used to give the game a little flavor. If you end up being a character who is a villain or is associated with a villain like character, that does not necessarily mean you are mafia. Also, to any new players if you haven't read the General Game Rules please make sure you do as well as the Forum Rules and CoC. - Mafia: Kills a villager every night. Wins if they outnumber villagers during the day. # Various depending on the number of players. - Cop: Investigates one person every night. 1 Cop. - Weak Doctor: Protects one person from being killed every night. However, if they accidentally protect a mafia aligned person, they die. 1 Weak Doctor. - Cops: You may hint at who you find innocent or guilty if you have been outed, but you can not flat out say who is innocent or guilty. - Ghosts: Ghosts are players who were killed at night or was lynched during the day. You may leave your last words with a vague hint to who is mafia, but you can not flat out say who is mafia. Also NO POSTING AFTER YOUR LAST WORDS. If you post after your last words you may lose points for cheating. - Mafia, Cop, and Doctor Votes: All votes from power roles are REQUIRED to be sent to the Game Host via PM. No outside contact with the Game Host on your vote. - Lynches: Lynch votes will continue to be posted in the game thread. NIGHT 1 WILL BEGIN AFTER EVERYONE HAS CHECKED IN AND THE GAME HOST HAS OFFICIALLY ANNOUNCED NIGHT 1. Please check in with your character name. There are 2 Mafia Members in this game. 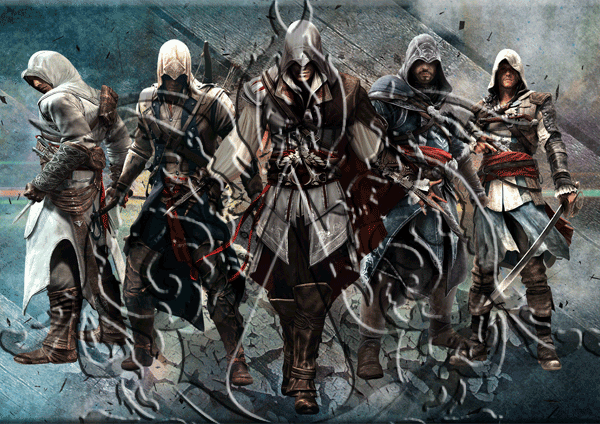 Re: Assassin's Creed Mafia~Mafia wins! There are 2, sorry about that. I'm gonna get this thing uploaded and go back to bed, cause it's early for the gaming college student. So Night one MAY end before I get up, IF it does I'll post once I actually wake up not just when I can have the bandwidth to myself. So again May and If on the night stuff guys and gals. My character looks wonderfully devious. I had a dream mafia got themselves bombed! That's everyone!! nifty shifty night people send unto the Ed thy actions for the nights!! natashasurgirl wrote: I had a dream mafia got themselves bombed! Ezio was so focused on finding the people responsible for killing his father and brothers that he didn't stop to look behind. The Borgia mercenary killed him with little fight. Zodia the cop has been killed!! Oh no Ezio! Why didn't you look behind you?! Day 1 will end on Noon CST tomorrow or until a majority vote has been made. i know! oh wait.. I messed up.. hold please for corrections. Desmond was too busy looking for the Apple and a way to save the world that he didn't notice Abstrgo thugs sneaking up on him. Yami the Doctor has died. Small note sorry for the mess up! This is my first time to ever host. so again sorry! My sorry!! My so very sorry! Would this be a game over since there are two mafia and 1 townie and 1 bomber left with no Doctor and no Cop? I dunno.. i've never hosted before... so yeah i haven't any clue, is that how it's usually done? I guess. yeah. well then there's the fact that the bomb is town aligned so the mafia and the town have even numbers at this point. so I dont think it's over just yet, am i right in that? the rules for hosting on that point aren't overly clear to me. If the Bomber is townie aligned then yes the game would be over (I'm assuming). Because that's 2 mafia and 2 non-mafia with both cop and doc dead. That's means mafia is equal to the number of players left. Right then, I do believe this game is over then. In that case Mafia Wins. Way to go on a really quick game guys and gals!